Fans of Hell’s Kitchens most well-known crime fighters will be very excited for Sideshow Collectibles new giveaway. 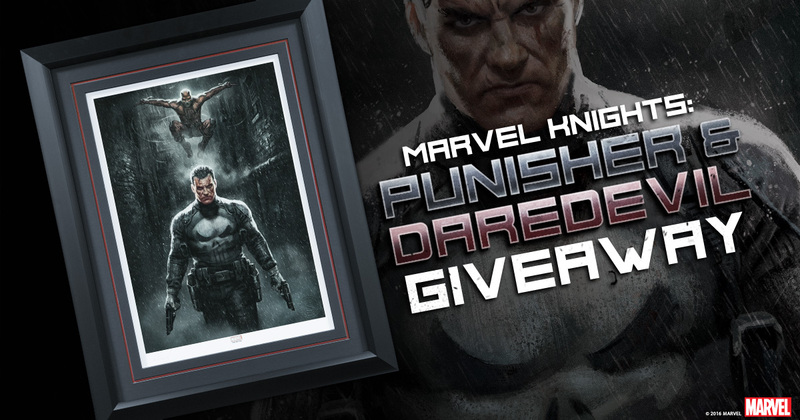 Enter today for a chance to win the Marvel Knights: Punisher & Daredevil Framed Premium Art Print. Limit one entry per person. All winners agree to pay shipping on any prizes granted by Sideshow Collectibles during any contest or giveaway. International winners (including EU regions) will be responsible for VAT, duties or import fees on the shipment of their prize that may be assessed by their governments. Due to custom requirements, the prize will be assigned a value of at least US$1. 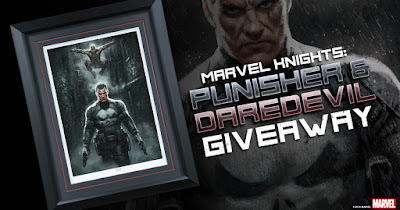 ONE (1) randomly chosen person that enters this giveaway will win the Marvel Knights: Punisher & Daredevil Framed Premium Art Print once this contest has closed. The potential winner will be contacted by email with confirmation instructions, so watch your inbox! Important Prize Shipping Information: the Marvel Knights: Puinsher & Daredevil Framed Premium Art Print will be shipped to the winner once it arrives into our warehouse, which is estimated to be between April - May 2016.